A "sockdolager" is a knock-down blow. This is a newspaper reporter’s story of his unforgettable encounter with the old "Bear Hunter" from Tennessee - Davy Crockett. This is the story of Congressman Crockett's coming to understanding of what made America exceptional among all societies in human history - the US constitution. Congressman Crockett votes against a Bill, on principle, that even most conservative US Congressmen would support today. It illustrates the type of thinking that lay behind the writing of the US Constitution and the imperfect grasp of its principles common in even many of its bravest defenders. It shows very plainly why freedom is struggling to survive in today's America. "CROCKETT was then the lion of Washington. I was a great admirer of his character, and, having several friends who were intimate with him, I found no difficulty in making his acquaintance. I was fascinated with him, and he seemed to take a fancy to me. I was one day in the lobby of the House of Representatives when a bill was taken up appropriating money for the benefit of a widow of a distinguished naval officer. Several beautiful speeches had been made in its support—rather, as I thought, because it afforded the speakers a fine opportunity for display than from the necessity of convincing anybody, for it seemed to me that everybody favored it. The Speaker was just about to put the question when Crockett arose. Everybody expected, of course, that he was going to make one of his characteristic speeches in support of the bill. He commenced:"
"Mr. Speaker—I have as much respect for the memory of the deceased, and as much sympathy for the sufferings of the living, if suffering there be, as any man in this House, but we must not permit our respect for the dead or our sympathy for a part of the living to lead us into an act of injustice to the balance of the living. I will not go into an argument to prove that Congress has no power to appropriate this money as an act of charity. Every member upon this floor knows it. We have the right, as individuals, to give away as much of our own money as we please in charity; but as members of Congress we have no right so to appropriate a dollar of the public money. Some eloquent appeals have been made to us upon the ground that it is a debt due the deceased. Mr. Speaker, the deceased lived long after the close of the war; he was in office to the day of his death, and I have never heard that the government was in arrears to him. This government can owe no debts but for services rendered, and at a stipulated price. If it is a debt, how much is it? Has it been audited, and the amount due ascertained? If it is a debt, this is not the place to present it for payment, or to have its merits examined. If it is a debt, we owe more than we can ever hope to pay, for we owe the widow of every soldier who fought in the War of 1812 precisely the same amount. There is a woman in my neighborhood, the widow of as gallant a man as ever shouldered a musket. He fell in battle. She is as good in every respect as this lady, and is as poor. She is earning her daily bread by her daily labor; but if I were to introduce a bill to appropriate five or ten thousand dollars for her benefit, I should be laughed at, and my bill would not get five votes in this House. There are thousands of widows in the country just such as the one I have spoken of, but we never hear of any of these large debts to them. Sir, this is no debt. The government did not owe it to the deceased when he was alive; it could not contract it after he died. I do not wish to be rude, but I must be plain. Every man in this House knows it is not a debt. We cannot, without the grossest corruption, appropriate this money as the payment of a debt. We have not the semblance of authority to appropriate it as a charity. Mr. Speaker, I have said we have the right to give as much of our own money as we please. I am the poorest man on this floor. I cannot vote for this bill, but I will give one week’s pay to the object, and if every member of Congress will do the same, it will amount to more than the bill asks." "He took his seat. Nobody replied. The bill was put upon its passage, and, instead of passing unanimously, as was generally supposed, and as, no doubt, it would, but for that speech, it received but few votes, and, of course, was lost. He continued his employment for about ten minutes, and when he had finished he turned to me and said: "Now, sir, I will answer your question. But thereby hangs a tale, and one of considerable length, to which you will have to listen." 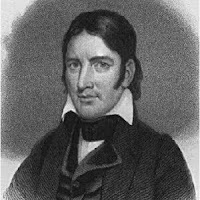 I listened, and this is the tale which I heard:"
If you want to know how Davy Crockett came to such a profound understanding of the US Constitution, go to this by page Bob Livingston at Personal Liberty Digest. The second half of the story is even better than the first. Like all great men, Crockett was humble enough to learn from men far less famous and honored than himself. The American republic can only be saved if America's people and leaders re-discover the US Constitution as Davy Crockett did. Great article -- and be sure to click on the link. Horatio Bunce is as terrific as Dan'l Crockett. Remember the Alamo! As a native Texas, I certainly adore our Davy Crockett. Trouble is, the whole story is bogus; it never happened.